Now in a new edition with an updated look and format, this re-launched series consists of three volumes made up of 63 lessons, with accompanying audio CDs. Each volume – Elementary, Intermediate, Advanced – is designed to suit students at different levels, and each meets the needs of 180 teaching hours. 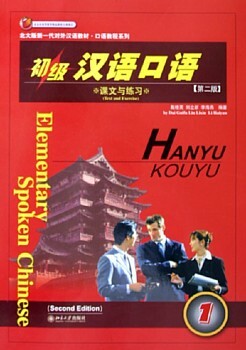 These textbooks are aimed at beginning students who want to master the basic elements of spoken Chinese. These books emphasise sentences and their uses rather than words and their meanings, and aim to train students to express themselves by combining sentences to make paragraphs as soon as they begin learning the common sentence patterns and simple dialogues. The topics are designed to be interesting to foreign students. Vocabulary index, Classifier and English translation of text from exercises give students the opportunity to practice basic spoken Chinese in hypothetical social situations.The two volumes for each level comprise a Text/Exercise book and a Vocabulary book.